Heres my forge. 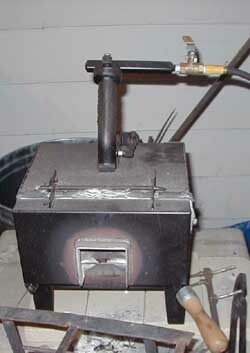 Its pretty small, only heats up about 6" or bar at once...im hoping to gather up a few dollars and buy a better forge. Left: The hammer was made from 1/2" x 1" mild steel bar that was folded 5 times (welded) and then i used a rectangular punch that i made to make the hole in the center fit the wooden handle. 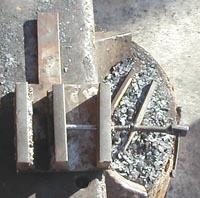 Center: The hot cutter was actually fabricated before i had the ability to do forge welds. I used various pieces of steel, welded them with a mig and then there you go. However, i still used carbon steel that was oil quenched for the cutting blade. Right: This is a paper thin hot cutter. Its made from 1085 steel that was folded 4 times and then oil quenched. 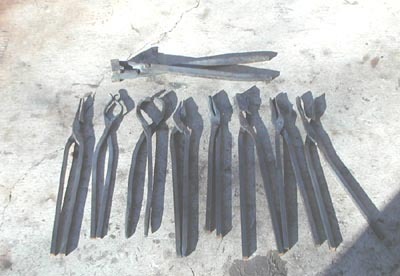 These are all different types of home made tongs i have. I made this vice by using a thick bolt and nut for the 'moving' mechanism. Its designed to fit in my tool hole on my anvil and has a built in cutting plate. 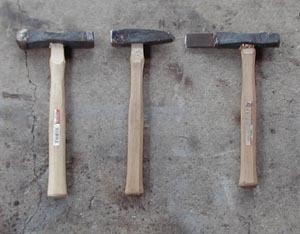 Left: a round faced and square faced forging hammer (2lbs or so with a carbon steel face). 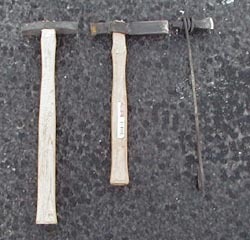 Center: A cross pein hammer with carbon steel face (2lbd or so). Left: A hot cutter with a 1085 cutting insert.